In occasion of the10th anniversary of the 9/11 hoax, I am opening this thread called "UNDEBUNKABLE SEPCLUES". -The mainstream media (foremostly, the major 5 US TV neworks + the British BBC) were the prime abetters and accomplices of this gigantic psyop, allowing the wretched planners of 9/11 to 'hijack' their airwaves to broadcast a completely pre-fabricated 'Hollywood' movie during the crucial 102 minutes necessary to demolish the WTC complex. 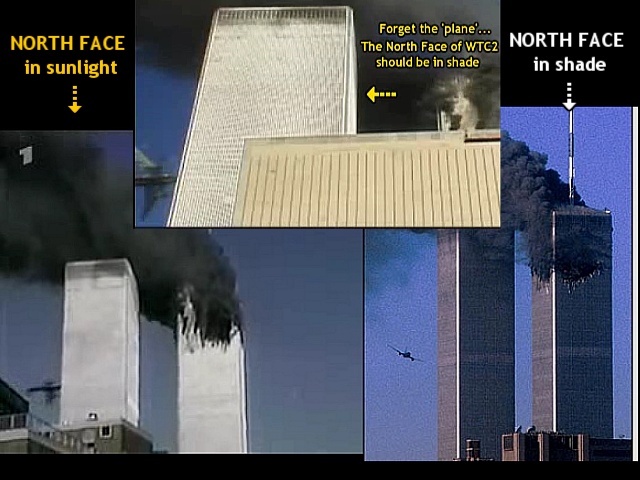 No airplanes were hijacked on 9/11 - only airwaves were. 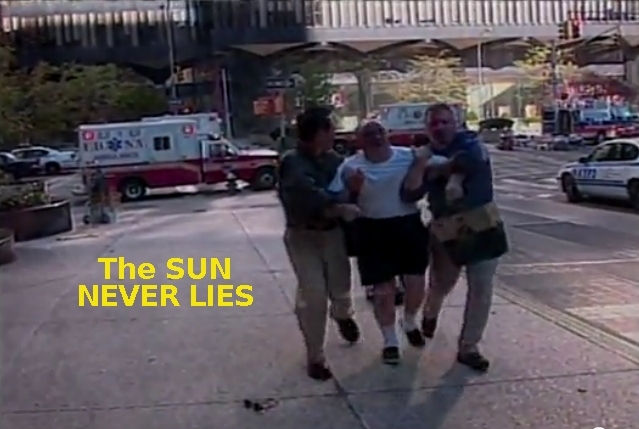 - NO existing imagery of 9/11 can be trusted, since none we have analyzed in these 4+ years has stood up to scrutiny, and none has met the standards & criteria expected of authentic video, audio or photography. The fact that no credible imagery is to be found strongly suggests that every possible means available to the 9/11 perps were deployed to keep private imagery from leaking to the public or, more plausibly, to even be captured at all. The latter hypothesis is supported by a long list of electronic disruptions which occured during the crucial 102 minutes of the event, suggesting that EMP/HERF jamming devices (routinely used in modern electromagnetic warfare) were in place during the crucial 102 minutes of that morning. For more info about that, please go to: http://www.septemberclues.info/visual_control.htm"
The many "UNDEBUNKABLE SEPCLUES" will be added to this forum section which is accessible only to our administrators. This, in order to provide a one-stop overview for all newcomers to this research. If this topic title sounds to you like a 'call to arms', you are perfectly correct. I think we're all here a bit weary of the lame and vapid attacks on our work - and it is now high time to ask the 'debunkers' to fess up or shut up. I will, of course, duly give credit to anyone's personal findings in the titles of such submissions to this thread - and that's why you will also see me giving credit to myself at the top of every post here. You see, a tactic of our opposition is to say "you have plagiarized other people's research - therefore it is null and void!". Let us not give them this handle - and duly sign our respective contributions. This is a collective research. of course, but we need to acknowledge everyone who helps it along. The more, the better. 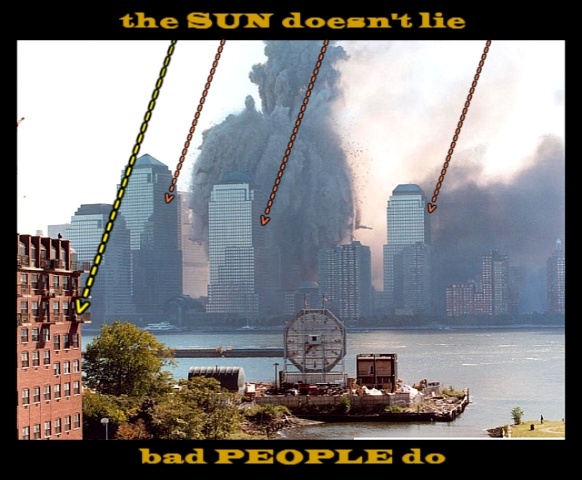 Now, to anyone justly wondering about the origins of the imagery analyzed henceforth in this thread, please know that they have ALL been aired on TV and, to be sure, are traceable to officially released video productions purporting to report the real events of 9/11. Anyone questioning the 'authenticity' of the imagery analyzed by the longstanding September Clues research can verify it for him/herself, with the same patience that I have (for over 4 years). All I'm asking here is: don't spend your time questioning my audio and video sources. Spend your time verifying them for yourself! I'm only one man - not an information bureau and much less a full-time archivist. However, rest assured that I have safely archived and kept track of all the gigabytes of source material analyzed in the September Clues research. To expose the Biggest Cheaters of this planet. NOTICE FOR NEWCOMERS TO THIS RESEARCH FORUM: To those seriously motivated and interested, please know that all the analyses published in this thread have been debated for several years and, to this day, have not been disproved or debunked in any way. Should one particular 'SEPCLUE' arouse your interest - and should you wish to see how it was debated - please submit a request in the 'Chatbox' and I'll do my best to source those debates for you. However, do keep navigating this forum and get familiar with it all - using your own energies! The "X" is approximately where this "FAT JOE falling on sidewalk" scene supposedly played out. Not possible on the morning of 9/11. The sunlight came from almost the exact opposite direction. Undebunkable? Yes. I'd say so. But you can always try and disprove it. These three pictures are simply irreconcilable. They are dramatically conflicting. They simply do not match: THE SUN DOES NOT LIE. 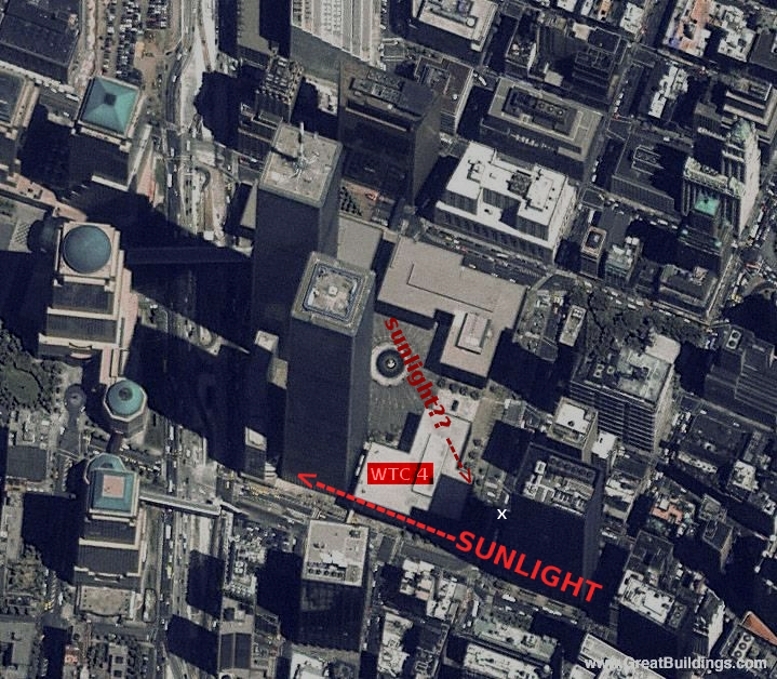 The North face of the WTC was either sunlit or in shade. You cannot have it both ways. Thus, both of them cannot be real. It is up to you to believe that ONE of them is real - but the other cannot be. Would you now possibly consider that BOTH are fake? Undebunkable? No: You are free to believe that ONE of them is real. However, that belief is up to you to cajole and defend. These shadows (those on the red building at left - versus those seen in the Manhattan backdrop) are simply irreconcilable. THE SUN DOES NOT LIE. Undebunkable? Yes. But you are free to believe that this picture is real. However, that belief is up to you to cajole and defend. These two pictures are simply irreconcilable. They are dramatically conflicting. They utterly do not make sense. Thus, both cannot be real. Undebunkable? Yes. But you are free to believe that ONE of them is real. However, that belief is up to you to cajole and defend. 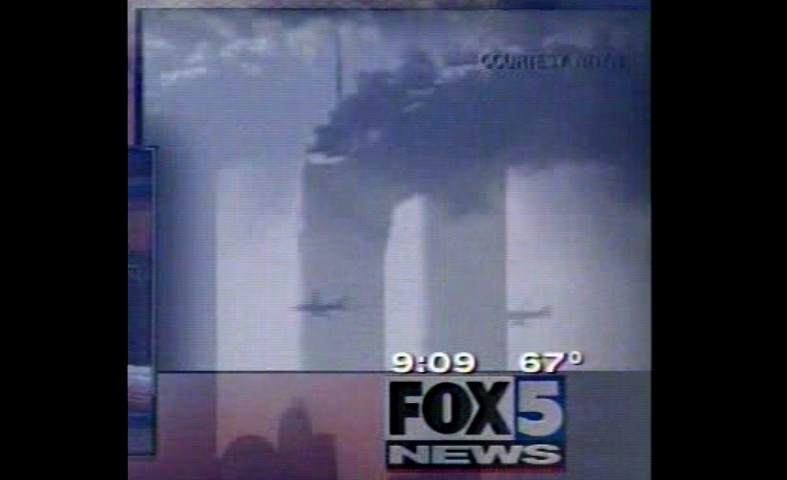 Various helicopters are seen (and NOT seen) flying by the WTC towers just as they collapse. The issue of the "VANISHING CHOPPERS" is thoroughly expounded (in more detail and better resolution than the above gif loops) in my "SEPTEMBER CLUES ADDENDUM". SIX OF A KIND ! Now, if you are inclined to argue that these 6 shots are the result of some extraordinary coincidence (6 cameramen standing within feet of each other), I will respond with a snotty sentence that has been thrown at me for years by the silly little army of aspiring debunkers of September Clues out there: "You have mental issues. Please take your medication." Sorry folks, but I can't be more sincere than that - and to hell with nice manners. I have observed them for way too long - let me now call a spade a spade. SHOT 1: Credited to "Michael Hezarkhani"-------------SHOT 2: Credited to "Luc Courchesne"
SHOT 3: Credited to "Evan Fairbanks"--------------------SHOT 4: Credited to "Jennifer Spell"
I know (from experience) that some people will immediately counter-argue : "SO WHAT? 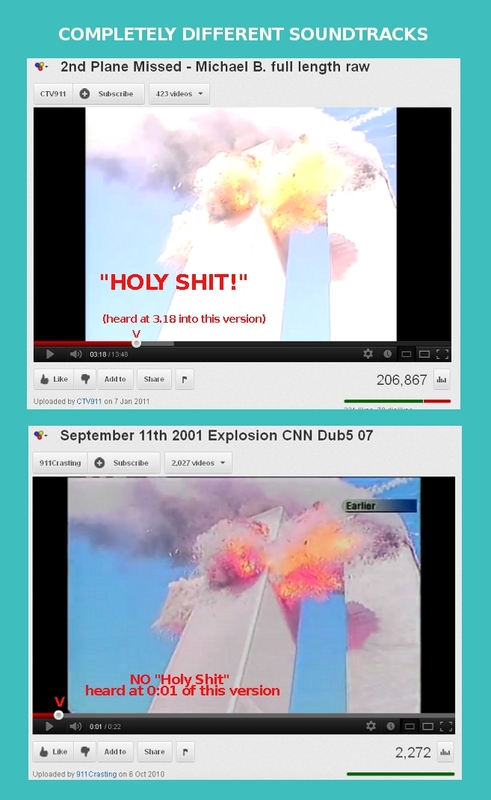 THIS IS WHAT THE TV CAMERAS CAPTURED ON 9/11!" Fine. So I'll now ask everyone to consider the odds of these 4 cameras capturing a sequential series of shots showing 'FLIGHT 175' entering and exiting their given lens views in seamless fashion. Does this seem likely - or can you say "fabricated animation sequence"? I call this the "16-second magic sequence". You will have to be very convincing if you are to tell people that this was all a matter of pure happenstance. Please know that these mere 16 seconds of 'plane footage' make up THE GRAND TOTAL OF AIRPLANE IMAGERY THAT THE TV NETWORKS SHOWED LIVE ON 9/11. September Clues part E demonstrates that an audio signal (a double-beep) is to be heard - simultaneously - on each and all of the USA TV networks, exactly 17 seconds before the "FLIGHT175 impact". That audio signal was most likely a classic synch-lock beep - as commonly used in film studios to align/synchronize any given set of film segments. This would, of course, have been necessary to synch the various 'plane-approach' segments to be aired live on the 5 different TV networks (CBS, NBC, FOX, CNN, ABC). 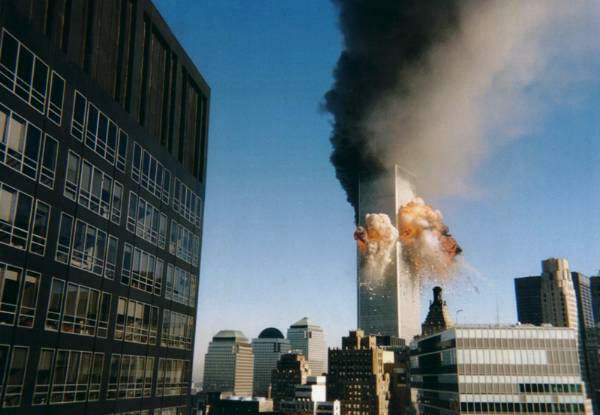 Why do the towers have a thick, black outline - and why is this outline skewed/misaligned at the top of WTC1? Note: The original file used for the above gifs was a high-res MPEG2 downloaded from the official TV archives. 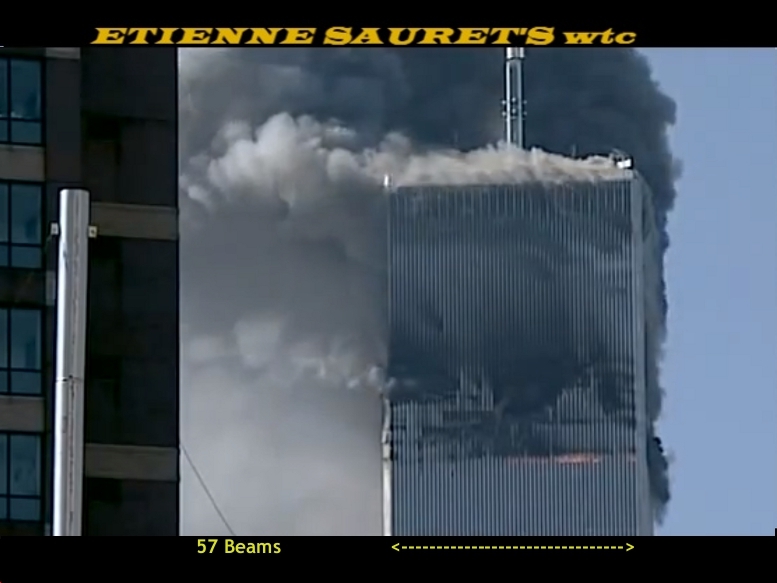 Any claim of what we see being ascribable to "standard video compression artifacts" should be backed up/ demonstrated with any given, similarly converted (broadcast quality compressed to MPEG2 ) pre-9/11 video featuring the WTC towers. (At 36:30 into the above archive clip, there is a version of the same shot - zoomed-in/cropped by CBS itself). Then, try reproducing the below shot - and win a ride on NASA's next manned mission to Mars! This is hoping you are all enjoying your (animated) flight ! There is a film I watched recently [for the life of me I cannot remember the name of it, it was that memorable, but I will come back with it when it finally 'pops' into my head] and as the credits rolled there was a scene exactly with a view from a 'news' chopper with the thing 'jigging' around but the back-drop remaining static. My first thought was SepClues/9-11. Whether this was put in to appeal to the 'sensibilities' of viewers [I'm sure TPTB want to brainwash the younger generations with action scenes that pass for reality] and prime them to accept that this is how the world looks even when the news shows it, I don't know but it seemed fairly obvious in a backhanded way, if that makes sense. 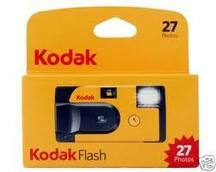 Can anyone else remember seeing a movie with this 'shot' right near the end/credits? 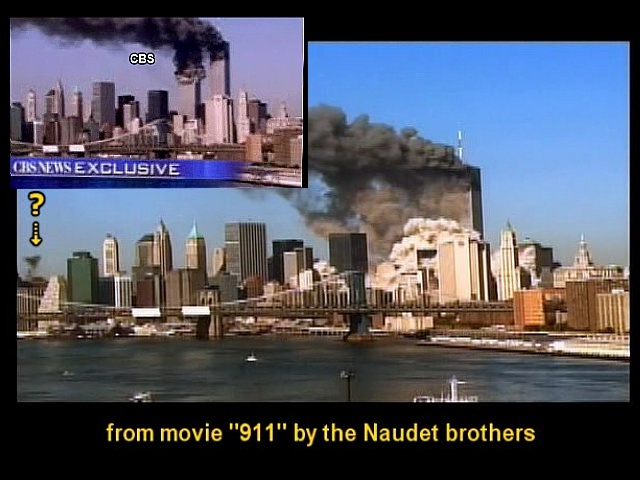 Edit: the film was nothing to do with 9-11 which is why it struck a chord with me at the time.